For so many, back pain is a reality that affects every aspect of their lives. 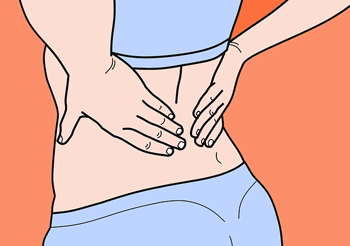 When you suffer from back pain it can feel like you just aren’t able to do anything. It can make you feel like you aren’t yourself anymore. While it may seem like lying down and staying comfortable until it “gets better” is the best option, that isn’t necessarily the case. Keeping yourself moving and doing cardiovascular exercise can help you feel stronger, healthier and more like yourself again. Why is Cardio Good for Back Pain? 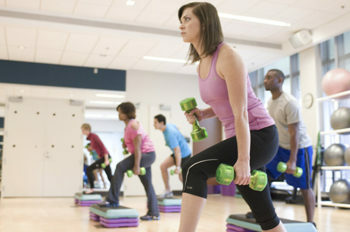 When you’re doing aerobic exercise you are increasing blood flow, which carries oxygen and nutrients to your muscles. This helps them not only get the things they need to work and repair themselves, but it carries the waste products away as well. Increased blood flow also decreases stiffness that contributes to muscle and joint pain. Cardio can be good for injured backs. The ProForm Hybrid Trainer XT is identical to the regular Hybrid Trainer with a slightly different look. Losing weight is another effect of aerobic exercise that can be beneficial for back pain sufferers. Controlling your weight can reduce the amount of stress placed on the spine and joints. It’s easy to focus on the physical effects of back pain, but the mental effects can be just as difficult to handle. According to the Mayo Clinic, “depression can cause pain and pain can cause depression.” Exercise can counteract this by producing endorphins. These boost your mood and help you have a more positive outlook. In addition, endorphins act as a natural painkiller, helping alleviate your pain without the use of medication. A study published by The Spine Journal show that exercise is not only safe for individuals suffering from back pain, but can also reduce the physical pain and cognitive effects on the individual. By addressing all of these different areas, you have a better chance of getting back to work, your family and your life sooner. While it’s important to keep moving when you’re experiencing back pain, it is important to not overdo it and potentially strain yourself more. The American Heart Association recommends 150 minutes of aerobic activity per week. This can be broken up in a variety of ways to best serve your needs and ability. Find what works and feels best for you and keep moving forward! When you’re experiencing pain, working out can seem impossible. But knowing what will work for you can help you see what’s within reach. Arming yourself with the knowledge of what is safe and effective will help you be less afraid of possible setbacks as you take those steps forward. For back pain sufferers the key is to do exercise that gets your heart pumping and your muscles firing, but is low-impact on the body. You want to ensure that you are stretching, conditioning and strengthening, while minimizing impact and twisting. 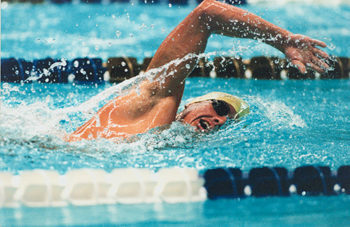 Swimming and Water Sports – Any exercise in water is a great option for those suffering from pain. When your body is in water, it is more buoyant, so it actually seems to weigh less. At the same time, water decreases the pull of gravity which compresses your spine and the surrounding muscles. Less weight/less gravity = less pain. Swimming is a great cardio workout that exercises all of the muscles in your body. You can also try water aerobics which uses the resistance of the water to push you without adding any impact! 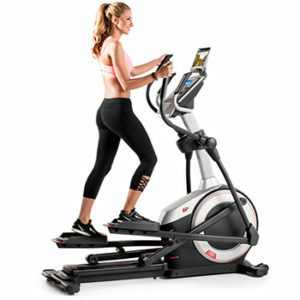 Elliptical – Getting your cardio minutes on an elliptical is a perfect example of a low-impact workout that won’t strain your back. You’ll receive all of the benefits of running while maintaining a smooth even motion. Maintaining proper posture will ensure that you aren’t twisting or bending your spine. Setting the timer and resistance levels lets you find the workout that’s just right for you. Indoor Cycling – Indoor cycling provides you with a way to get the aerobic benefits of cycling without the bumps, potholes and obstacles you may encounter on the road. 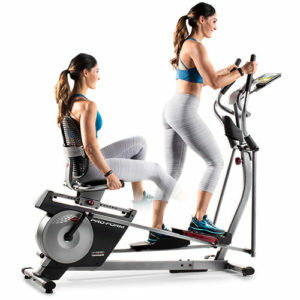 An upright bike will keep your spine stationary, but you can even use a recumbent bike if a reclining position is more comfortable. With the popularity of spin classes in recent years, you can find a class near you that provides the motivation and expertise of a trainer with the companionship of a group! Walking – While it may not always seem like the most aerobic exercise, walking is an easy and effective way to get yourself up and your body moving. Make sure that you have high quality shoes to alleviate even small impact from your feet on the pavement. 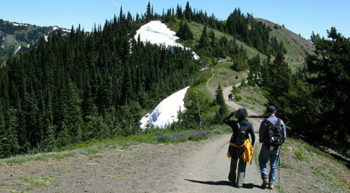 Using a treadmill is a perfect way to walk without worrying about environmental obstacles. Yoga – Yoga is an excellent way to both address and alleviate back pain. Focusing on poses that lengthen your spine, while stretching and strengthening your muscles will help ease soreness and stiffness. As you practice, you will increase your flexibility which allows for better muscle function and ease of movement. Yoga also helps to align your spine and hips which lets your muscles to relax so you experience less discomfort. 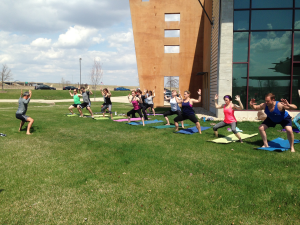 Johnson Fitness employees, makers of Horizon ellipticals, participate in yoga on the front lawn. Strength Training – While the thought of strength training when you’re in pain may sound crazy, strong muscles are necessary for everything you do. You certainly don’t need to start pumping iron and try to make huge gains, but there are some things to focus on. Your core muscles, both your abdominal and back muscles are crucial when you experience back pain. These muscles support your spine and improve your posture. This allows you to properly carry your body weight and protect your spine without adding undue stress. Being injured or in pain can be a scary thing for anyone, regardless of their activity level. But it’s important to remember that it doesn’t have to stop you from being you. Starting an exercise program that is suited to your needs will help you win the physical and mental battle against pain, so you can participate in your life again. www.mayoclinic.org : Daniel K. Hall-Flavin, M.D.